1 of 5 Heat oven to 350 degrees . Add gingersnaps to a food processor; process until finely ground (yields about 1 cup). Pour in melted butter; process until well combined. Insert 12 liners in a standard-size square or round muffin pan. Press 2 tbsp of the ground gingersnaps firmly into each liner. 2 of 5 Beat goat cheese and cream cheese with a hand mixer on low until smooth. Add 2/3 cup of the sugar and the salt; beat until combined. Incorporate eggs one at a time, then add vanilla. Beat on high until smooth, about 2 minutes. 3 of 5 Pour evenly into muffin liners. Bake at 350 degrees for 15 minutes, until set. Cool to room temperature, then refrigerate until cold. 4 of 5 Meanwhile, combine blackberries, raspberries, blueberries, remaining 1 tbsp sugar and 1 tbsp water in a pot. Cook over medium heat until berries burst, about 5 minutes. Cool. Refrigerate until using. 5 of 5 Remove cakes from pan and peel off liners. 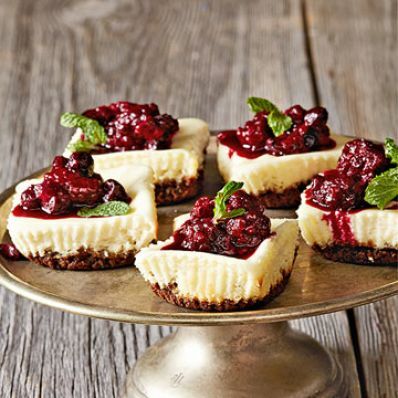 Spoon berries on top of each cake and garnish with mint leaves, if using.